Viewing a thread - How good are these two books? How good are these two books? Subject: How good are these two books? Subject: RE: How good are these two books? Location: Ohio The one on the right, “1950’s Chrysler” is a good general reference book. 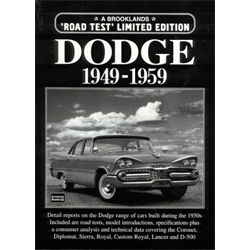 It has individual sections for Chrysler, Dodge, Desoto, Plymouth & Imperial models subdivided by the year. Each section pulls most of the information from factory brochures & focuses on the year to year design changes / updates. Though the info is not overly detailed or in-depth. Along with photos - original factory & restored cars, almost all in color. Also includes charts with production numbers for each model year. 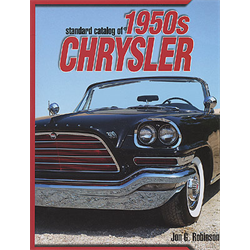 Location: Melbourne, Australia The 50s Chrysler book is amazing , but has many mistakes . Should you find the Postwar Years, buy it on sight. Location: Ponder, TX I don't have either of the books mentioned in the original post, but I have The Dodge Story. It is a good book with hundreds of pictures, but all in black and white. The book is organized by years, so it's easy to find whatever you're looking for. I also have Dodge 100 Years, written by Matt DeLorenzo, and published by Quatro Publishing Group. Great color photos, but not very well organized and not much Forward Look. Bought those two today plus the 46-85 Dodge Identification guide. Total for all three was $42 (50% off sale). Beware of blatant errors. Doesn't anybody use fact checkers?